It was a change of pace on Day 5 of the Under 18 National Championships, with the ten teams shifting their attention to the 50-over format. Fresh off a disappointing loss in Friday's T20 Final, ACT/NSW Country recorded a six-wicket win against Victoria Country after successfully chasing down the target of 109 in just the 20th over. It was a dominant effort with the ball that made life easier for the ACT/NSW Country batters, with Emma Hughes (4-20) leading the way with four wickets while Anika Learoyd (2-9) and Abby Taylor (2-18) were also among the wickets. ACT/NSW Country set about chasing the total, with the majority of top order batters making contributions and scoring at a much faster rate than that of the Victoria Country batters. Learoyd was a standout with the bat, top scoring with 34 to top off an impressive all-rounder performance. Tasmania also made a strong start to its 50-over campaign, defeating the Northern Territory by 36 runs. Tasmania posted 145 batting first, with Amy Smith 26 best with the bat. Amber Cloughessy was best with the ball for the Northern Territory, claiming 3-11. The Northern Territory started strongly as it set about chasing down the total, reaching 4-81 before a dramatic collapse of 7-28 ended its innings on 109. The Cricket Australia XI (CA XI) continued their impressive run, overcoming Victoria Metro by 29 runs. Winning the toss, the CA XI elected to bat first and set Victoria Metro 153 for victory. Georgia Voll (33) and Kate Peterson (25) led the way with the bat, while Erika Quinn (3-38) stared with three wickets. It was a disastrous start from Victoria Metro with Tess Flintoff dismissed without scoring, as the CA XI piled on the pressure in the field. Jessica Matin (25) toiled hard along with a number of teammates who reached double figures, but it wasn't enough as the CA XI continued to find ways to take wickets and restrict Metro to 123. NSW Metro proved too strong in its match against Queensland, claiming a narrow 19-run win. Sydney Thunder player Hannah Darlington compiled an important 40 off 67 balls to anchor the NSW innings, while contributions from Dharmini Chauhan (17), Shivani Mehta (24) and Stella Campbell (21) helped boost the total to 169. In reply Queensland reached 46 before losing 4-4, but a 65-run partnership between Kirsten Davey (39) and Kate McDonald (20) got their side back on track. Isabelle Afaras (3-23) and Olivia Porter (1-21) claimed late wickets to restrict Queensland to 150, 20 runs shy of victory. The final match of the day saw South Australia easily account for Western Australia thanks largely to half-centuries to Rachel Church (73) and Emma de Broughe (72). 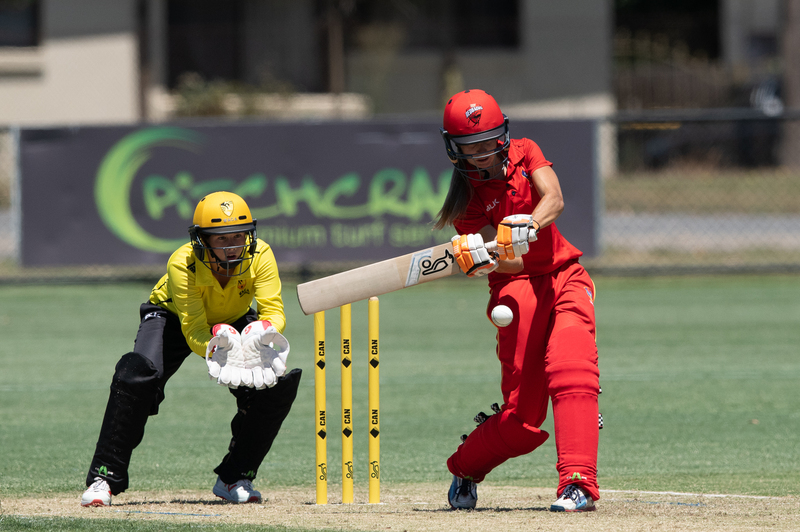 The duo combined for a 125-run partnership to help South Australia post an imposing 8-216, while Emma Meuleman was best with the ball for Western Australia with four wickets. Western Australia got off to a positive start with the bat in reply with opener Gorgia Plattern posting a patient 44. The rest of the batters struggled to make any significant inroads however with wickets falling at regular intervals and the runs drying up, Western Australia only managing to post 148 which was well shy of the required target.